Perhaps one of the strangest stories of evolution is that of the whales – the descendants of wolf-like creatures who roamed the Earth eons ago. Proteins in their genomes once coded for legs, and their fins are actually shaped like hands with wrists, reminders of their long, proud mammalian lineage. It seems strange – why did animals whose long ago descendants crawl out of the sea onto dry land, return to the sea? The obvious answer is survival, adapting to an ever changing world. As to how, the short answer would be that it simply didn’t happen overnight. The modern hippopotamus, whose name literally means “water horse,” is actually a distant relative of the whale, a four-legged mammal that spends much of its life in the water. 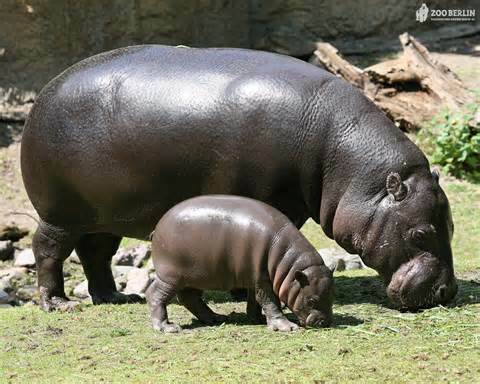 The hippo family shares a number of ancestors that adapted to living in water for the long term. Now, a recent fossil expedition in Africa has unearthed what paleontologists suspect may have been one of the first hippos to have roamed the Earth. The first hippo, paleontologists estimate, based on the size of the newly excavated animal from a Kenya rock bed, was likely a little larger than a modern horse, just a little smaller than modern hippos, and weighing several hundred pounds. “They are slender hippos, very thin hippos,” said Fabrice Lihoreau, a paleontologist at the University of Montpellier in France who co-authored the new paper. This newly discovered creature, known as Epirigenys lokonensis, also had its evolutionary roots in Africa, as the study confirmed. The genetic evidence suggests that the common ancestor shared by hippos and whales existed some 53 million years ago. Epirigenys first roamed the Earth a mere 15 million years ago – with only a few known specimens found in between. The current hypothesis is that one of the prehistoric ancestors of hippos were a family of semi-aquatic mammals, the anthrocotheres, which appeared around 40 million years ago. At one time, these ancient beasts were prevalent across the globe, with fossils found everywhere from North America to Asia. However, any ancestry it had to hippos was never identified. The inspiration for this dig began at Kenya’s Nairobi Museum, where Lihoreau and his colleagues stumbled upon one small exhibit in the collections – a rather unusual jaw belonging to an anthrocothere. This particular jawbone had been discovered at the Turkana Basin, a fossil-rich rock formation in Kenya, where the rock layers carry a myriad of fossils dating all the way back to the Cretaceous Period and leading right up into the present day. Among the fossils in these rocks are our own recent ancestors, the Homo erectus and the Neanderthals. The exact location where the jawbone was located was a large body of water 28 million years ago, containing a plethora of crocodilian fossils. Unfortunately, the rock’s thickness made digging difficult, where they risked damaging the fossils. While they hunted for new potential locations, the researchers took notice of a small spot called Lokone Hill with considerably softer rock that could easily be removed with acid, making the excavation much easier. The first few finds were of several uncovered teeth, which they confirmed had come from a new species of anthrocothere, previously unknown to science, and newly discovered at the Lokone Hill, found alongside sets of molars and incisors, the trademarks that this certainly belonged to a mammal. Most promising perhaps, was that the molars bore a striking similarity to the teeth found in modern-day hippos – bearing a prominent pattern that looked like a bladed three-leaf, not too different from a maple leaf shape. The new species earned its name Epirigenys lokonensis, a rough translation from Latin into “original hippo from the Lokone,” according to Lihoreau. It was this molar pattern which linked the E. lokonensis as the hippo’s direct ancestor. (the teeth of mammals, particularly herbivorous ones, are so distinct from each other that any discovered patterns found on the molars almost act as a fingerprint for the species.) Paleontologists who are lucky enough to find one can establish a clear lineage between an extinct creature and its closest living descendants. E. lokonensis weighed only about 220 pounds according to Lihoreau’s estimate, which is considerably smaller than the plodding two to three ton hippo that roams the African wetlands today, an aggressive creature that may or may not have earned its fearsome reputation as the most dangerous animal in Africa, known to attack if provoked. Just like their modern ancestors, however, the Lokone hippo lived primarily in the water. The paper describing this new species was published yesterday in the journal Nature Communications.